This is one of my favourite recipes for the simple fact that it tastes really yummy and it takes no less than 10 minutes to make. As working woman we don’t always have much time to prepare big gourmet meals for our families. 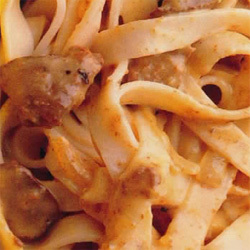 With this recipe you can put a scrumptious meal together for your family in no time. My son usually leaves his meat and only eats this sauce and chips. This I discovered was his version of chip and dip. So whether you feel like steak or chips this sauce tastes amazing on both. Note: you can use more or less maizena depending on how you prefer your sauce thickness. Best served with rump or fillet steak and a salad or chips go well with this dish. Start by heating the water in your egg poacher while you prepare the asparagus. In a pan on a medium heat, add the butter and when foaming add the asparagus. Cook them for about 4 0r 5 minutes until soft on the outside or until slightly browned bits begin to appear on the skin. Set the aside keeping them warm. If you are using bacon as well, use 2 slices of bacon per 1/2 muffin, cook and set aside. I use a poacher to poach my eggs which need to be medium with a soft center and usually takes about 3 minutes. While the eggs are poaching make the Hollandaise sauce and toast the muffins. Place the 3 egg yolks and the lemon juice in a blender or the container of a hand blitzer and give them a blits for about 30 seconds, then add the melted butter in a slow stream while blitzing and the sauce becomes thick, glossy and smooth. 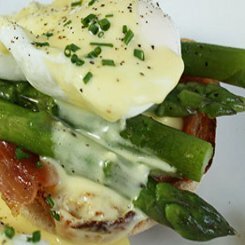 That’s it, place the bacon and asparagus onto the toasted muffin, then top with an egg and drizzle over the Hollandaise sauce and give a little grin of black pepper and salt. Satay sauce is the classic peanut sauce that you find in every Asian restaurant that is generally served with thin strips of chicken on skewers and is a fantastic starter or nible when you have people over. Make plenty, I have yet to meet anyone who does not like this sauce. It’s sweet, it’s savory, it’s very rich and just delicious. Add the oil with the garlic, and chili flakes to a pot over a medium heat and cook until the garlic is white and soft. Add the ginger and stir. allow it to cook for about another minute or so. Add all the rest of the ingredients and stir until the sugar has melted and the sauce is a smooth fragrant paste. 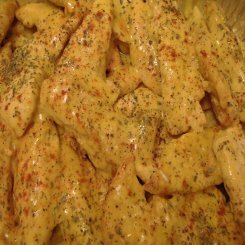 here is a chicken strip recipe that goes beautifully with this sauce. The thing you really do not want to do is overcook the chicken, they take a minute or so on each side and should be succulent and juicy. 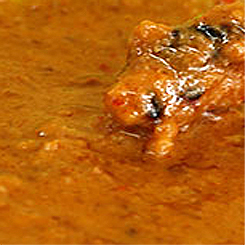 This is a fantastic little extra for any curry and takes just a few minutes from start to finish. If you are having a hot curry, you are going to thank me… Try it with a traditional biryani or any of the many other curries on the site just do a search for “curry”. Place whole garlic cloves or a whole buld in a 180 Celsius oven for about 20 minutes to roast. Do more than 1 bulb, the sweetness of the roast garlic is excellent with chicken or a good steak. Combine garlic and youghurt in a bowl and mix well. Add the rest of the ingredients,mix well and then season with a little salt. You can also add a chopped fresh green chili if you are a heat freak but I prefer it just like this. 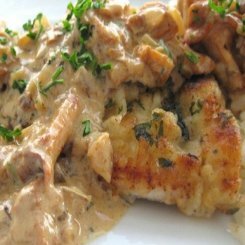 White sauces are really easy to make and are generally used to coat veggies or variations like a mushroom sauce or mstard sauce for meat and fish. I usually use a plain white sauce over poached smoked haddock for breakfast and it’s become a staple breakfast. 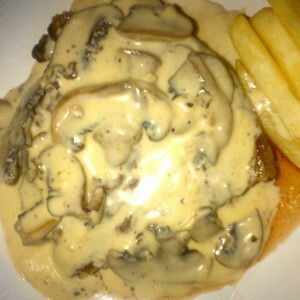 There is a cheese and a mushroom sauce below. This amount of sauce should be enough to smother veggies, meat or fish for 4 people. The basics are that you use the same amount of flour and butter. Heat the butter in a pan over a medium to low heat until the butter is foamy. Add the flour and whisk constantly for about 2 minutes. You want to cook the flour but not brown it. Then begin adding the milk in a stream whicking constantly until the lumps have dissapeared and the sauce is smooth and glossy and begun to thicken nicely. That’s the basic sauce done. If you are going to let it stand and want to prevent a skin forming, take a lump of butter and with a fork melt a little over the entire surface. Make the bechamel and add 4 tablespoons of grated cheese. if you are using a strong cheese like parmesan or gruyere taste after each tablespoon. Whisk until completely melted and smother you favorite veggies, eggs, fish…..
take about 60g off finely sliced mushrooms and add 2 tablespoons of water, a squeeze of lemon and season with salt and pepper. Gently simmer them until they are soft. Add about 3 tablespoons oil to a pan on a medium heat and fry the onions until they begin to brown. Add the chicken livers and cook, stirring until the begin to change colour. Add the cream and mix to combine and cook for 2 minutes. Add the beaten eggs, stir quickly and remove from heat. Season with and pepper and add to your favorite cooked pasta and top with finely grated parmesan cheese. 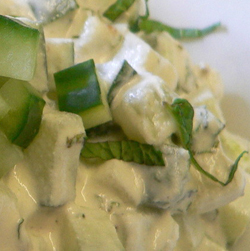 It is very rich so serve with a simple green salad. Flavor butter and leave it in the fridge for when you need them. They are handy to slice over quickly grilled fish, chicken breasts or even a steak or vegetables to add flavor. You can make a whole lot of different butters like garlic and herb butter, sage and garlic butter, anything really, just add your favorite herbs and they are always on hand. The rule of thumb is 2 or 3 tablespoons of herbs per 125g butter and always use fresh herbs. If your butter is unsalted butter add a pinch of salt as well. Cream together the chosen herbs with the butter. Take a sheet of cling film and place the flavored butter on end. Roll the cling film to the end and then take the free end and begin to twist until the it forms a firm cylinder and pop into the fridge until you need it. You get the idea, chop up any of your favorite herbs. You can also make sweet butters by adding honey for pancakes and crumpets. Orange juice, orange rind and a orange liqueur for crepe suzettes. Herb butters are great to flavour gravy as well and the butter thickens naturally. Use them on fish, meat or chicken recipes. I have been traveling for a few days and eating out quite a lot, which inevitably leads to steaks burgers and of course Monkey Gland sauce. here is a great recipe to turn your burger at home into a restaurant experience.